Tomcat Rat & Mouse Place Pacs controls rats and mice. 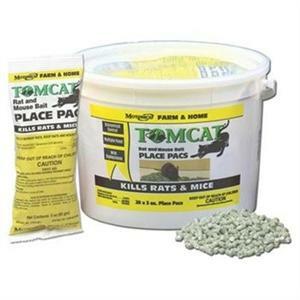 Tomcat baits are manufactured with human food-grade ingredients and enhancers, for a bait optimal for attracting rats and mice. Works in 4-6 days. Tomcat baits are manufactured with human food-grade ingredients and enhancers, for a bait so palatable that rats and mice ca. Kills rats and mice in 4-6 days. Pail conains 22 place pacs.